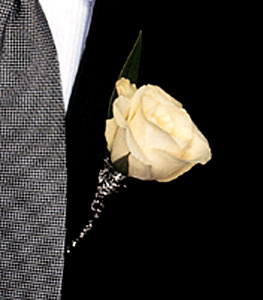 Clean, simple and so right - one spectacular white rose with a touch of silver, pinned to his lapel. The boutonniere stars one 60cm white rose, accented by silver bullion, black satin ribbon and laurel leaves. Page loaded in 0.2541 seconds.